The second page of the event setup allows you to add and edit ticket inventory and price levels. Enter the maximum total number of tickets available for this event across all ticket types and price levels. Capacity Settings. Designate the maximum capacity for the event. Using the dropdown selector, choose either Use Venue Capacity which was previously assigned to the event or Enter Event Capacity to override the venue capacity with an amount specific to the event. Max Tickets per Transaction. 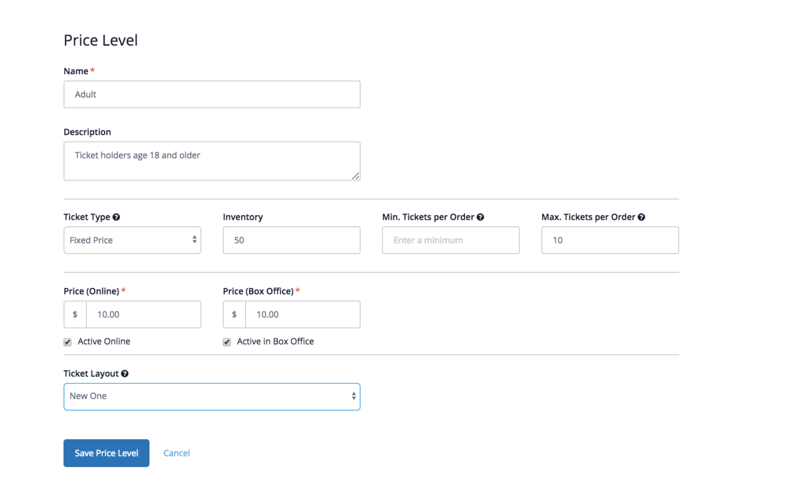 Enter the maximum number of tickets that can be purchased in a single order. Click Add Price Level, and enter details about the price level. Name. Enter the name of the price level. This name is visible to customers. Description. Enter any brief, additional details about the price level. Ticket Type. Select whether you want to determine a Fixed Price for the ticket, Pay What You Want to allow customers to name their price or Free if there is no cost. Inventory. Specify the total number of tickets available for the selected price level. Minimum Tickets Per Order. Enter the minimum number of tickets that may be purchased per order. Maximum Tickets Per Order. Enter the maximum number of tickets that may be purchased per order. Minimum Price. (Only available if you select Name Your Price.) Enter the minimum price that you will accept for this price level. This will be visible on the event page. Suggested Price. (Only available if you select Name Your Price.) Enter the default price you recommend your customers to pay for the price level. Active Online. Uncheck this box to prevent online shoppers from accessing or purchasing tickets for this price level. Active in Box Office. Uncheck this box to prevent box office users from accessing or transacting sales for this price level. Managing Price Levels Once a price level is set, additional actions are available which can be accessed by selecting the associated icon to the right of the one you wish to adjust.By default, price levels appear in order of price from lowest to highest. You may also manually arrange them by clicking and dragging the anchor icon located on the left of each price level. Edit. Click the pencil icon to adjust the details about the price level. Schedule a Price Change. Set a date and time to automatically change the face value of the price level. You may choose to apply the adjustment to the online price, box office price or both. Schedule a Status Change. Set a date and time to automatically activate or deactivate the price level. Delete. Remove the price level from the event. Products Allow customers to purchase merchandise or other non-ticket items at checkout. Add Product. Click Add Product, then select a previously added product from the dropdown selector. Click here to learn about adding products. Price. Specify a price for the product. The item’s default price (based on the product’s settings) is displayed as a recommendation. Placement. 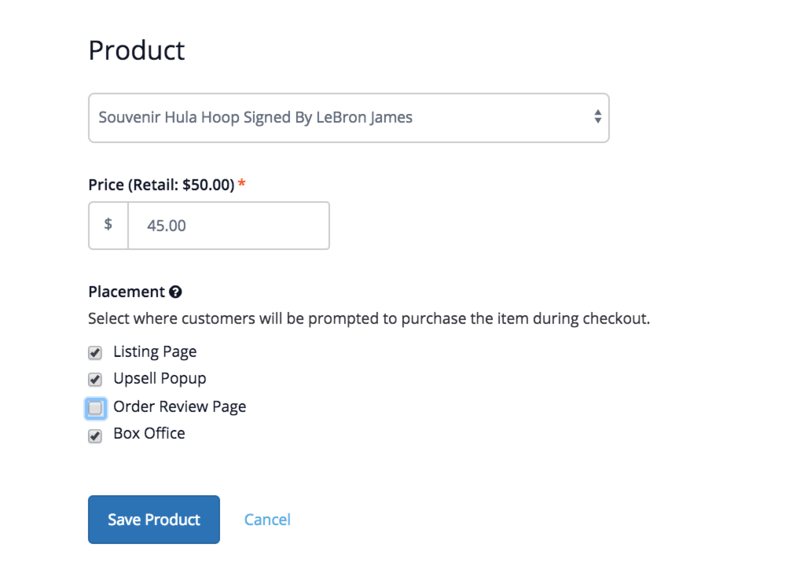 Select where the customer will be prompted to purchase the item during checkout. You can also determine whether the product appears in the box office. Bundles (Not available for all users.) A bundle is a group of tickets sold together, often at a discounted price. See Create A Bundle for more details.